k is Boltzmann’s constant (1.380658×10−23 J K-1) . Both Lν and LνP are shown in Fig. 1, for several temperatures. Fig. 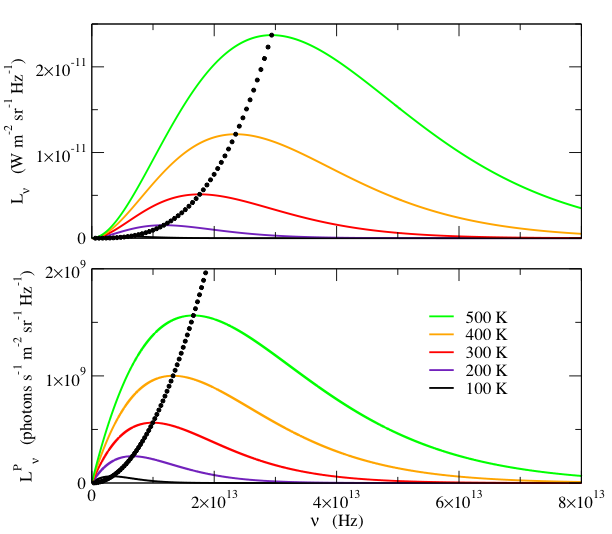 1-Spectral radiance, Lν, (top) and the spectral photon radiance, LνP, (bottom) as a function of frequency, ν, for various temperatures. The small black dots indicate the frequency and value of the peak, at 10 K temperature intervals. Note that Lν and LνP have different frequency dependences. Although the peak frequency is proportional to T for both quantities, Lν peaks at a higher frequency than LνP. Furthermore, the peak value of Lν increases as T 3, whereas the peak value of LνP increases as T 2.